BSNL Broadband generally comes with ZTE ZXDSL 531B Modem and you need to setup ZTE ZXDSL 531B modem yourself. And its not easy to setup this modem until you know all Configuration steps of ZTE ZXDSL 531B. 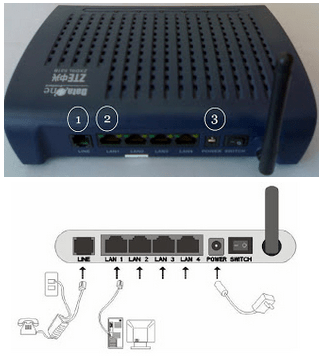 So here i will tell you the complete method to setup BSNL ZTE modem. Here i will tell you all the steps to configure and setup BSNL type 2 modem, and also how to set WIFI password on BSNL modem. And if you do not have your BSNL Broadband Username Password, then there is same common format for BSNL username and password. You can try that. Before begin with the configuration settings of BSNl modem, first we will do its hardware settings. Here i will tell you how to connect different cables with BSNL modem. First Plug-in the line from splitter to ADSL Port in modem and line from adapter in POWER. You can setup the modem by connecting it through LAN or WiFi. To connected your pc with lan or by wifi. Now Plugin the power adaptor to your wall plug and its pin to modem. Now connect a LAN to any port of modem and other end of LAN cable to your computer. Step 2: Next, click on edit button of VPI/VCI value 0/35 and follow the steps as shown below. Now type VPI as 0 and VCI as 35. Then click on Next. 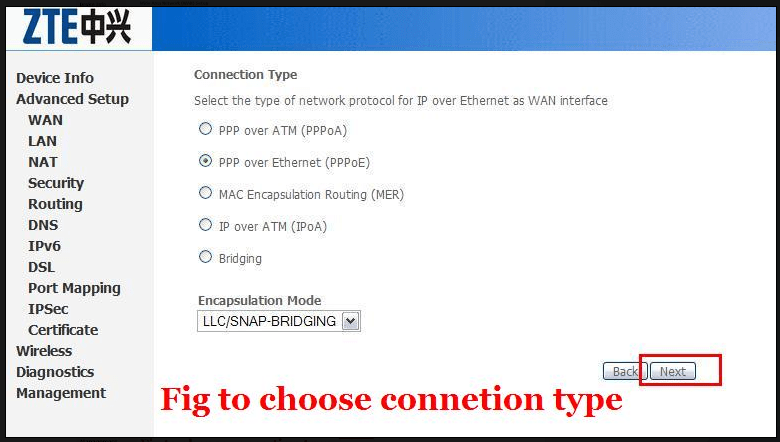 Now select PPP Over Ethernet (PPPOA) option. Then Click on next button. Now enter your BSNL Broadband username and password provided by BSNL. If you don’t have BSNL Username PAssword, then either ask the BSNL for it. Or i will tell you the general format of BSNL broadband USername. SH and SC are initials of holder. Rest is your telephone number and last part is same. The BSNL guys generally set such password so you can try them, its your luck if it works otherwise you can ask BSNL. Now select all the thinks and fill everything as shown in picture. Now save your configuration for BSNL modem. And keep on clicking next and save in last. Save changes and reboot the router, after reboot you should be automatically connected to the internet without dialing PPPoE dialer from the computer. You can also add the security like WEP/ WPA or keep it open. 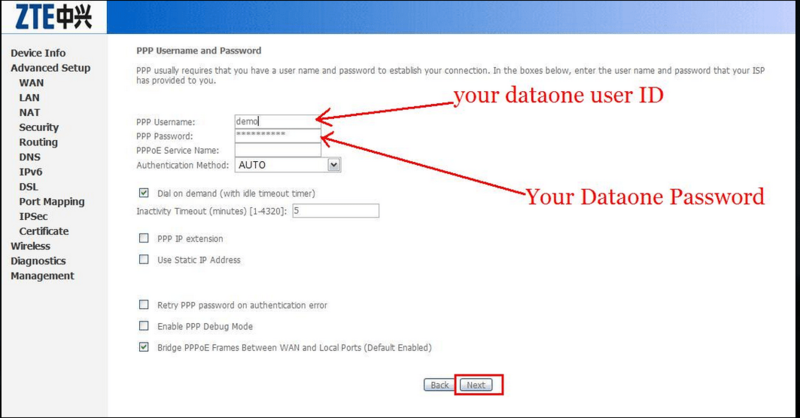 To set password on BSNL modem ZTE zxdsl 531b, follow the below steps. Select your Encryption Strength: 64 bit recommended and enter the Network security Key whatever you want but keep it remember. Now Save this WIFI password settings for BSNL modem. Reboot your modem. You have successfully set the BSNl modem wifi password. Simillarly you can change its wifi password. 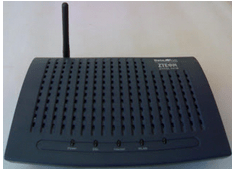 So now you have learned to setu BSNL type 2 modem of ZTE zxdsl 531b Modem. Now you can easily configure and modem with the above settings. If you still found any problem in setting up BSNL modem. Then comment below we will be happy to help.